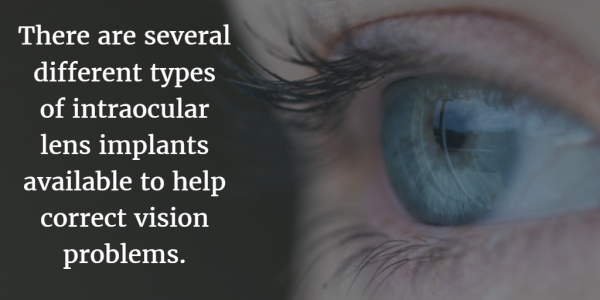 The benefits of perfect eyesight can’t be overstated. You have the ability to wake up and go about your day without reaching for contact lenses or glasses, and don’t have to worry about issues when you play sports or go swimming. New research suggests that you’re even less likely to develop eye infections when you no longer need to place contacts in your eyes every day. Many men and women with common vision problems, cataracts or other sight-threatening eye diseases avoid wearing corrective eyewear and resolve to strain their eyes to read a book or use a tablet or computer. Premium intraocular lens (IOL) implants or multifocal lenses offer 20/20 vision, so you no longer have to be concerned about scratched eyeglasses and missing contact lenses. Intraocular lenses are often used during cataract surgery to replace the clouded, natural eye lens and restore vision. Our eye surgeon, Dr. Richard Foulkes, prefer Premium lens implants such as the Tecnis® Multi-Focal IOLs and Tecnis® Toric IOLs because we believe they offer the best results for your vision. If you’re struggling with cataract symptoms or are interested in improving your vision, please contact Foulkes Vision in Chicago today at 630-724-1400 to schedule your eye exam and consultation. Dr. Foulkes serves patients in Lombard, Chicago and throughout Northern Illinois. This vision correction device is a surgical lens replacement for your eye’s natural lens. They can be especially well-suited to retirement-age people with relatively healthy eyes, and provide the benefit of immediate, flawless vision. Tecnis® IOLs are suitable to correct both nearsightedness and farsightedness. Toric IOLs provide a great alternative for patients who want a premium lens implant but also suffer from astigmatism. Why Choose Tecnis® or Tecnis® Toric IOLs? This technology falls into a broad class of modern replacement lenses called multifocal lenses. A multifocal isn’t just optimized for one distance: It actually provides better vision for reading, watching the sunset, and all the distances in between. A full range of distances means more convenience for you and a better quality of life. Cataract patients often experience presbyopia as well, which is a condition that affects your ability to focus on nearby objects. This occurs because your natural eye lens stiffens as you age and is the reason so many people require reading glasses. Traditional monodical intraocular lenses don’t correct presbyopia. That means, if you use reading glasses, you’ll still need them after having traditional cataract surgery. Tecnise® lenses, however, can provide permanent freedom from glasses or contacts. If you suffer from astigmatism, Tecnis® Toric lenses could be the perfect fit for you. Studies have shown that these aspherical lenses virtually eliminate astigmatism in 94 percent of patients who have them. Many patients who receive premium multifocal lens implants rarely need glasses or contact lenses following their procedure. Why Choose Foulkes Vision in Chicago or Lombard for Your Premium IOLs? Dr. Foulkes has extensive experience performing cataract eye surgery, LASIK, PRK, and other eye procedures. He has the expertise and skill necessary to identify the right ophthalmology options for you and provide you with optimal results. To find out if premium lens implants are right for you, please contact Foulkes Vision today at 630-724-1400 to discuss your options for improving your eyesight. Our eye surgeon and skilled staff serve patients in the Chicagoland area including Lombard.